SONNETS project aims to fully exploit the benefits of ICTs to help the public sector meet emerging societal needs. With this objective in mind, SONNETS has designed a methodological framework that will accelerate the modernization of the public sector through the identification and analysis of emerging technologies that hold the potential to transform the public sector into a technology leader and innovation carrier, addressing, at the same time, the most pressing needs of the citizenship. The goal of the SONNETS Framework is twofold and lies in supporting innovation both in the public sector and through the public sector. In the documents below you can find further information on the SONNETS framework or click here to play the explanatory video. 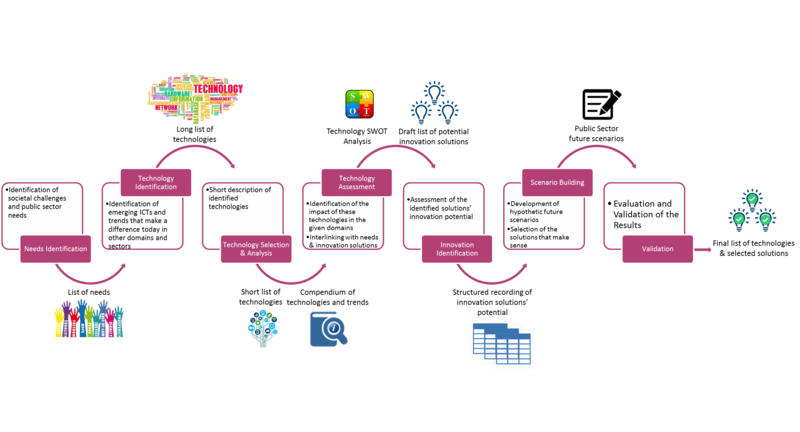 You can also use our templates for assessing the impact and feasibility of the technologies. We also invite you to share your thoughts on our approach with us and be part of the public sector transformation process! Just click on the Futurium link for discussion.